Hundreds turned out to Saturday's March for Science at the University of Maine as part of a global rally in opposition to President Donald Trump's questioning of climate change and deep cuts he is proposing for research. Jack French, 9, of Hampden was one of hundreds who turned out to Saturday's March for Science at the University of Maine as part of a global rally in opposition to President Donald Trump's questioning of climate change and deep cuts he is proposing for research. ORONO, Maine — A local version of the worldwide March for Science drew hundreds of scientists and those who support their work to the University of Maine campus on Saturday. 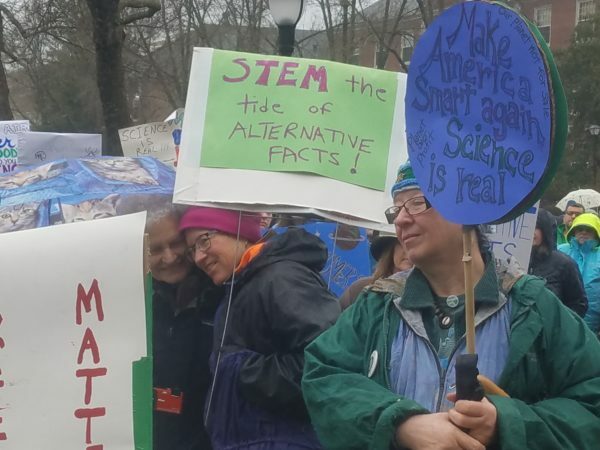 Similar protests took place in Portland, Machias and Sanford, which were among the 600 communities in the United States and abroad that held pro-science rallies in conjunction with the national March for Science in Washington, D.C. The protests, which fell on Earth Day, were sparked by deep cuts President Donald Trump has proposed for science and research budgets and by what many see as a growing disregard for evidence-based knowledge. Trump has called climate change a hoax. His proposed 2018 budget calls for deep spending cuts by government science agencies, including a 31 percent reduction for the Environmental Protection Agency, according to Reuters. Trump’s administration also is considering pulling out of the so-called Paris Agreement aimed at reducing global emissions of carbon dioxide and other greenhouse gases, according to the news service. 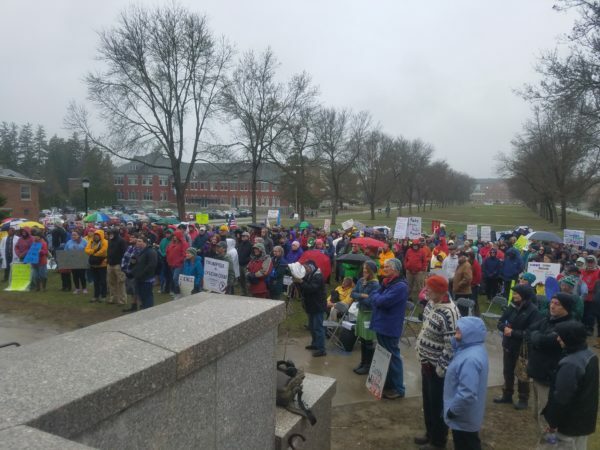 Despite a steady cold drizzle, the rally on the University of Maine’s campus drew an estimated 200 to 300 scientists, future scientists and their supporters to Orono. Speakers included members of UMaine’s Climate Change Institute and other state and campus groups. Dr. Ivan Fernandez, professor of soil science and forest resources and a cooperating researcher with the Climate Change Institute, credited science with advances in medicine, food production, computer technology and space travel, to name a few. “All of these are a result of science. They’re not perfect. There’s lots of issues embedded in everything I just talked about but clearly these are advances,” he said. Pollutants such as lead, greenhouse gases from the burning of fossil fuels and sulfur emissions are contributing to climate change and that research must continue, Fernandez said. “The clock is ticking. It’s pretty late in the game and certainly there are lots of reasons to be optimistic about what we can do by way of improving the environment,” he said. 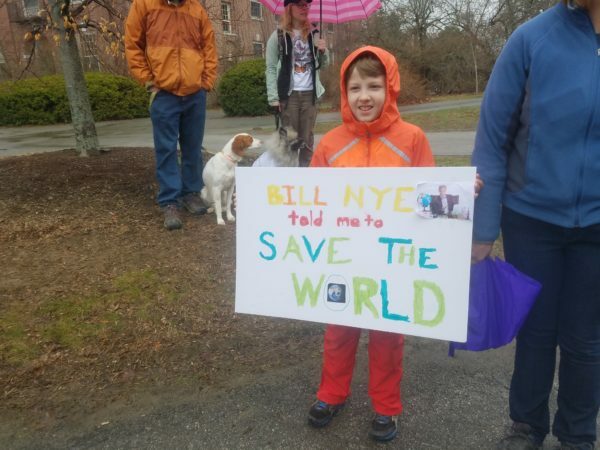 One protest sign that was a hit with many at the rally was made by was Jack French, 9, of Hampden, which read “ Bill Nye told me to save the world” and “There is no Plan(et) B” on the other side. Science is important because “it helps cure diseases and it helps improve lives,” he said. His mother, Laura French, said she is a supporter of STEM, which stands for Science, Technology, Engineering and Math. “I work to get kids involved in science, and kids are natural scientists, so it’s just a good experience for them to some see that so many people care,” she said.